So, if you're reading this, I'm probably en route to MI right now from Boston. SBL is over and now, it's back to family, work, etc. It's also time to read. In addition to the other books that I picked up at SBL, on my way out yesterday, I picked up a terribly unique book on the Gospel of Mark. I've never seen anything like this. It's Steve Ross's Marked. This book is insane! 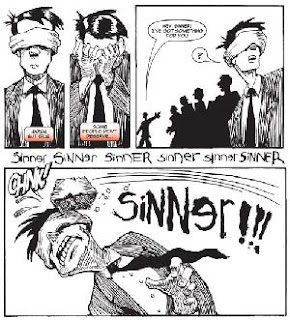 It is a comic book retelling of Mark's story, kind of arranged in a modern setting (see an example of a page to the left). I'm already a few pages in (and trying to adjust to this type of reading, which I have never been fond of!) but I like it...in an odd way. I hope to post a bit more about it in the near future. Anyway, SBL was good and I hope to post some more on that soon too. Blessings to everyone!